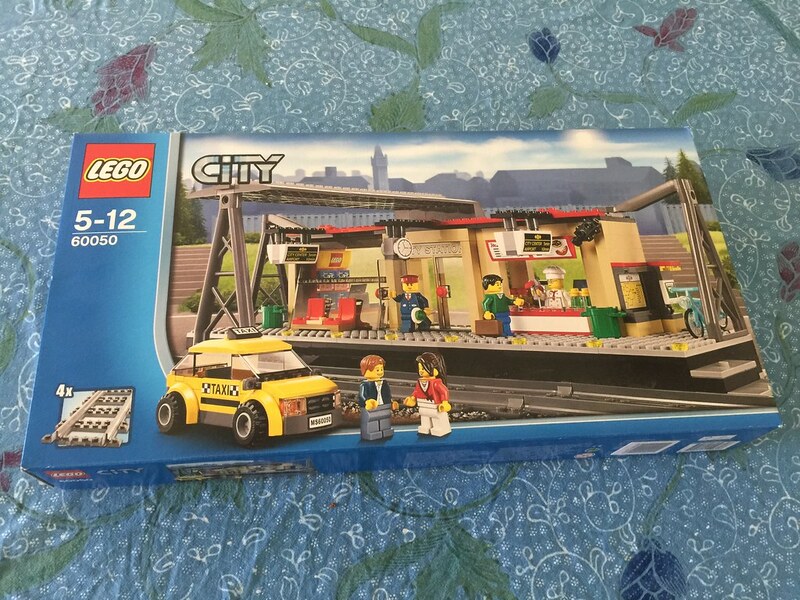 A while ago I got my first LEGO train set (60052: Cargo Train – yet to be reviewed). After getting it, I realised I needed to get a passenger station too! I had a look around the shops and found this one. There’s a lot of nice details to look at, and a lot of pretty great parts. The box contains five parts bags, a bag of plates, four straight tracks, three instruction booklets, and a sticker sheet with 19 stickers. There are lots of pretty great parts here. 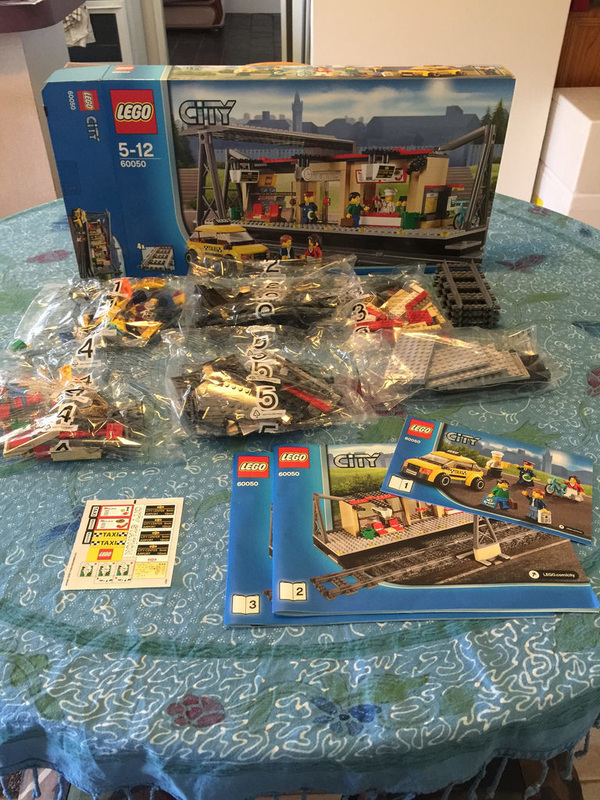 This set introduced the 1×12 brick in brick yellow. There’s also the red 1×8 plate with rail. This set was also one of the first two sets to have the dark grey ramp. Luckily for us, this set has six of them, used for the overhanging roof. Other notable parts are the two 2x12x4 windscreens, the bicycle in medium azure, the computer screen, and the lattice A-mast. 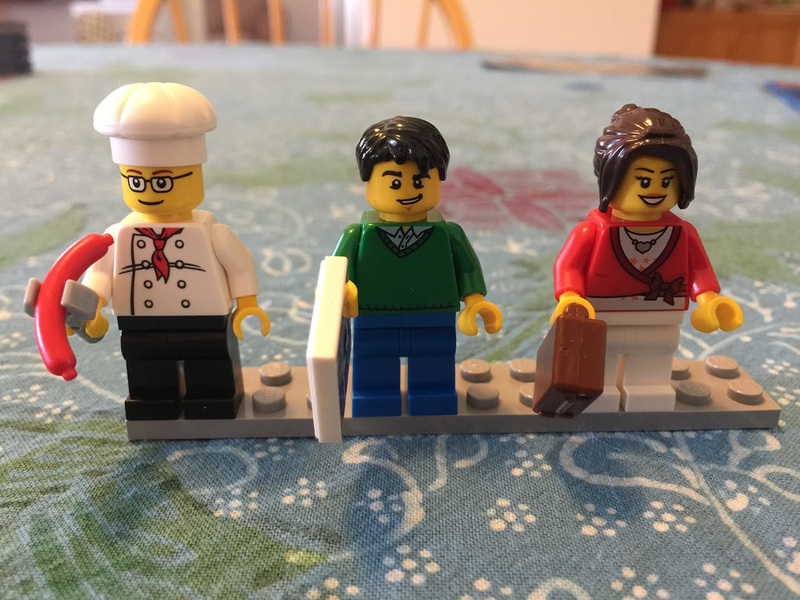 The five minifigures are pretty great. There’s a conductor, taxi driver, chef and two travellers. 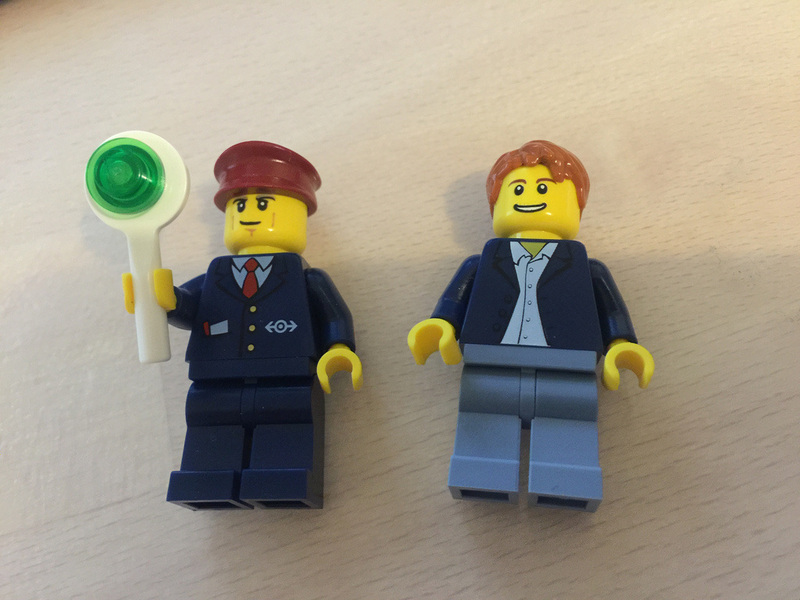 They’ve got some accessories, including a train conductor sign, newspaper, briefcase, and sausage and tongs. The guy in green and the woman have some very simple back printing also. 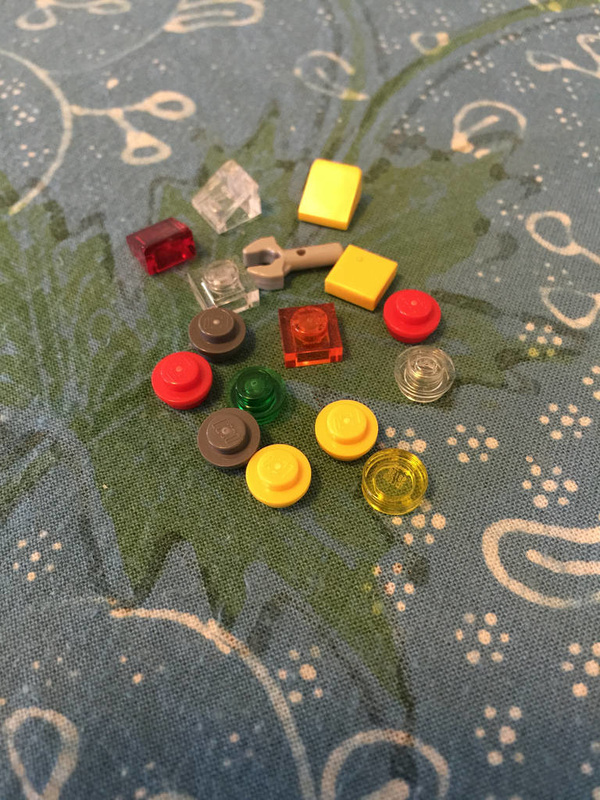 The spares are pretty standard for this set. The nice inclusion is the spare tongs. There are some pretty great features of this build. Technique-wise, it’s pretty standard, but has some great details, and looks like a train station somewhere in Europe. There’s a great little snack bar which has some very nice details including a little coffee machine and menu boards. 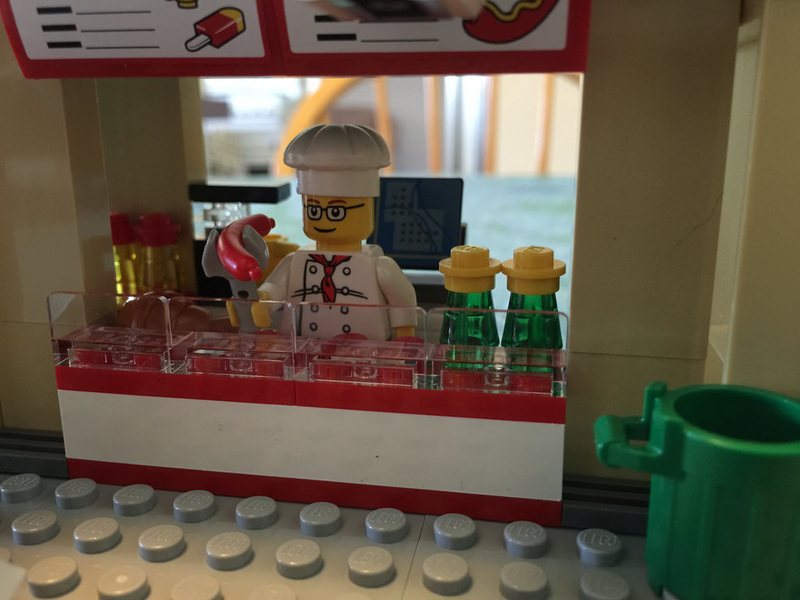 The LEGO store is great – it’s made up of a lot of stickers, but is a brilliant detail to include. 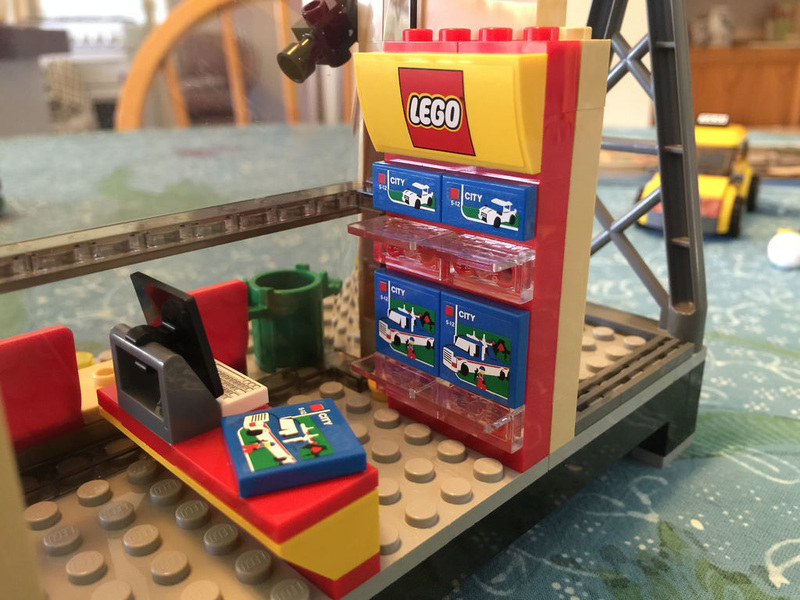 A LEGO store in a set is always good. I also like the train timetable boards and the clock, as well as the ticket machine / ATM. The train map is a sticker, but good in either case. The downside to this set is how it constantly falls apart when you move it. I’ve picked it up a number of times now to move it to a different location, and the roof, tracks and roof support pillar always fall off. Every single time I move it, I’m attaching the tracks and roof back on. There is only four connection points between the tracks and the station itself – there should be a few more to stop it from separating all the time. Apart from that, it’s a pretty good set. Lots of levels of playability, and some very nice details. 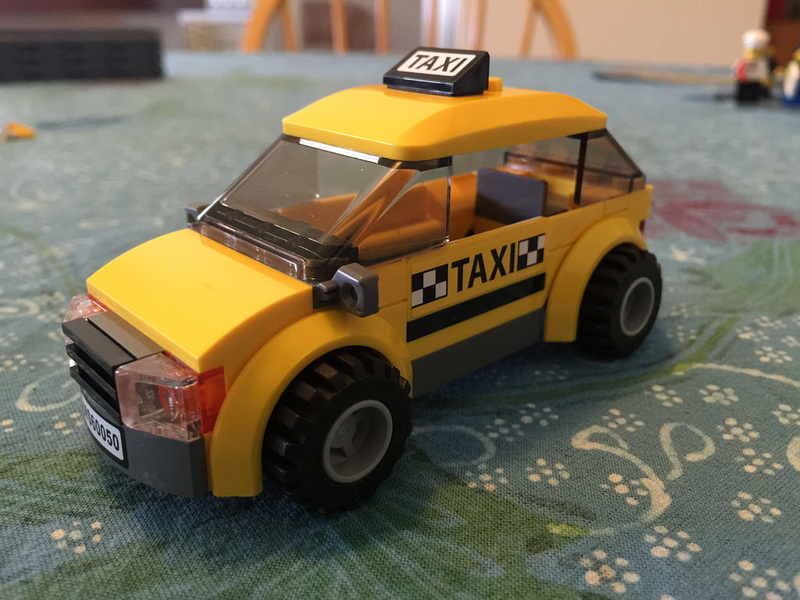 The taxi is great to look at, but there’s nowhere for it to go, so it kind of sits next to it looking a little out of place. The rest of the details in the station are perfect. 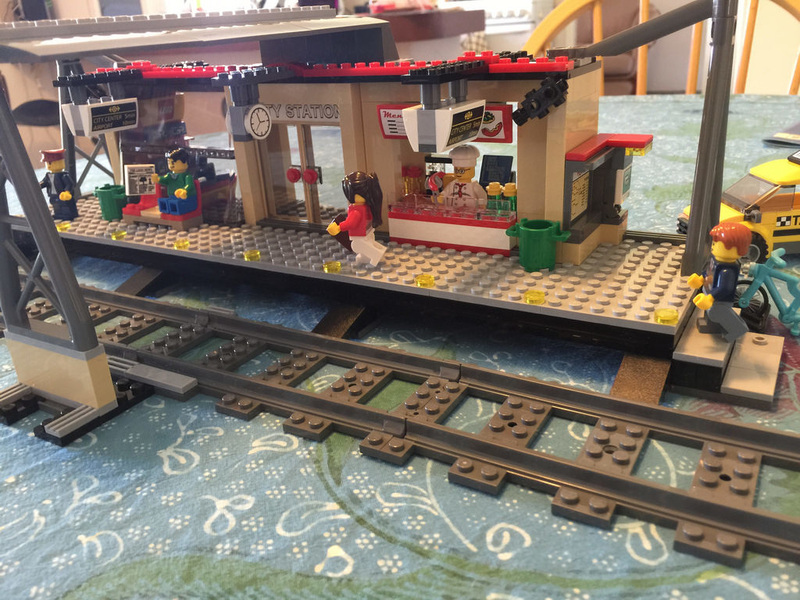 This set gets 7 out of 10 train tickets. It’s got some great parts too. Next on the review list is 60002: Fire Truck from back in 2013. An oldie, but a goodie! Don’t forget to like and share on Facebook!